Product #46487 | SKU SDCFSP-128G-A46D | 0.0 (no ratings yet) Thanks for your rating! 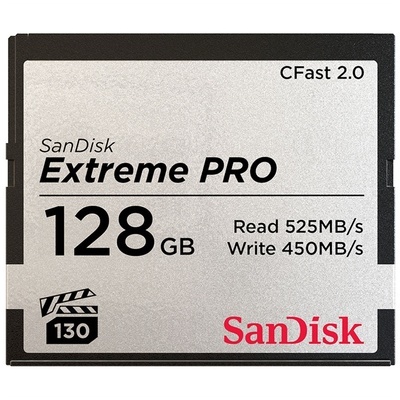 For those working in high-performance industries such as broadcasting, cinema, and photography, the 128GB Extreme PRO CFast 2.0 Memory Card from SanDisk combines the speed, capacity, and performance needed to record uninterrupted DCI 4K video, which has a resolution of 4096 x 2160 and a 17:9 aspect ratio. It features a SATA III 6 Gb/s bus, a maximum read speed of up to 525 MB/s (3500x), a maximum write speed of up to 450 MB/s (2933x), and a minimum write speed of 130 MB/s. Its minimum write speed is backed up by the Video Performance Guarantee 130 standard (VPG-130), meaning that its minimum write speed will never drop below 130 MB/s. This card has been tested to work in temperatures of -20 to 70°C, and in the case of card errors or accidental deletions, this card comes with a RescuePRO Deluxe data recovery software download offer. Additionally, thanks to ARRI's Software Update Package (SUP) 5.2, this card is also compatible with select ARRI digital cinema cameras. This memory card can operate in temperatures ranging from -5 to 70°C.